It’s 5pm on New Year’s Eve, and I am relaxing, just trying to conserve energy in preparation for tonight’s antics: multi-course dinner at home with my moglie – wife – and her boyfriend (yes, you read that right), followed by drinks with friends and wandering to the ancient Imperial Forum for the Negramaro – italian rock band – concert and fireworks. I hope I survive, something tells me that Romans, alcohol, and fireworks don’t mix. Anyway, I am laying in my roman bed, in my roman apartment, texting in Italian on my ghetto roman phone, and thinking about how much my world has changed. This time last year, my world was Portland – a gorgeous city with my incredible family and amazing friends. My world was NCAA and NFL football games, summer barbecues, road trips, workout buddies, and line dancing. It was a world of comfort, support, and unconditional love. It was a life that I adored. Portland is amazing. But as one of my best friends said, “For you, Portland is a cage. And no matter how beautiful the cage, at some point every bird needs to fly.” This time last year, I found my wings. I flew from Portland to Istanbul to Olympos to London to Lucca to Dubrovnik to Mostar to Rome on a one way journey. I allowed myself to dream beyond the beauty of Portland, beyond the comfort of home. As a result, my world is larger than it has ever been. It now consists of Islamic mosques and Renaissance cathedrals, of paragliding and cliff jumping, of Olympos and Butterfly Valley, of ethnic cleansing in the Balkans and riots in San Giovanni, of Lucchese dialect and Roman slang, of stargazing and kaifing. In my world, I am now a foreigner, a wanderer, a bartender, a nanny, and an English teacher. In my world, I drink Turkish tea in the afternoon and Grappa or Limoncello after dinner, I eat menemen and carbonara, I dream in two languages. In my world, I am an aunt or a sister in the Gelli and Pierallini families. Without a doubt, my world has grown and will continue to grow at an exponential rate. It has truly been an extraordinary year and I’m excited to see what curveballs 2012 decides to throw. 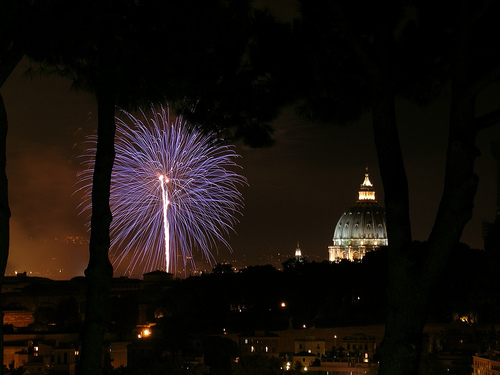 Buon Anno – Happy New Year! This entry was posted on December 31, 2011 by Katie. It was filed under Ramblings . You have made a most amazing and brave leap to another life and to other worlds. You have made this happen and you have shared your experiences and thrills with us. I hope your life continues to see the wonder and continue to appreciate what is in front of you. I think that you have exposed yourself to some spectacular places and experiences. I know that whatever you do, whether it be in Portland, San Francisco, or anywhere else, you will see the good in it. I’m hanging with you! You have made this fun for all of us. Writing this, it is almost exactly 10 months since I met you in Istanbul, in the very beginning of your journey. You told me then that it was unlikely that you would remember most of the people who were to cross your path. However, I for sure remember you. When looking backwards in time, you can always find some people and meetings that, however brief, inspires you to change your life for the better. To me, you will always be one of those people. Meeting you made me realize that I can affect my own life and I did. Meeting you also made me realize how much I value curiosity, in others but most of all in myself. Even though I have not set out on a journey in distance, I have done so in mind. Going your own way is not always easy but it brings its rewards. The second half of 2011 was by far the best half year in my entire life. For the continuation of your journey, I wish you the same happiness that I have experienced for the last few months. Thank you for helping me re-find my path.